Grand Tour On the Table: Accessing Antiquity through English Ceramics - Bardith, Ltd. The Grand Tour of the seventeenth, eighteenth, and early nineteenth centuries took the English into the Continent to experience the seat of Western culture in the Italian peninsula. Tourists often had an education in the Classics, which made travel to ancient sites such as Rome and Naples popular. These Classical sites welcomed travelers who in turn picked up inspiration from antique architecture and artifacts, then brought it back to England to incorporate into new designs. In asking John Brewer’s question, “Whose Grand Tour?” we find that Grand Tourists were primarily men, and more specifically young men who had recently completed their schooling. Women only occasionally embarked on the Grand Tour, and when they did so they focused on foreign cultural and societal customs rather than Classical themes as did men. This article will examine the Grand Tour’s influence on eighteenth- and early nineteenth-century English ceramics, a medium through which women could experience travels on the Continent. First we will establish the ceramic designs’ roots in antiquity in order to show their conscious reference to antiquity. We will then trace the trajectory of eighteenth- and early nineteenth-century English ceramics from the origin of their designs to their final destination on the table. Grand Tour designs on English ceramics brought travel into the home, allowing female users to access the antique and participate in their own virtual travels. The designs on these ceramics had to pass through many male hands before arriving in the (female) domestic sphere. Sir William Hamilton was the leading figure in bringing ancient ceramics and their designs back to England. Though his official business in Italy was as the British ambassador to Naples, Hamilton is perhaps better known as a collector of classic antiquities. For example, in Joshua Reynolds’s portrait “the British envoy at Naples is painted for posterity not in his formal diplomatic role but as a possessor and publisher of a collection of ancient Etruscan vases” (Fig. 1). Hamilton was an antiquarian and engaged himself with the collecting of Greek vases, an undertaking that was not difficult as the region was experiencing a flurry of archaeological activity. Hamilton’s collection of vases were sent back to England, eventually to be donated to the British Museum. We think also, that we make an agreeable present to our manufacturers of earthenware and china, and to those who make vases in silver, copper, glass, marble etc. Having employed much more time in working than in reflexion, and besides being in great want of models, they will be very glad to find here more than two hundred forms, the greatest part of which are absolutely new to them; then, as in a plentiful stream, they may draw ideas which their ability and taste will know how to improve to their advantage, and to that of the public. Fig. 1. Joshua Reynolds, Sir William Hamilton, 1777-1782. Oil on canvas. National Portrait Gallery, London. Fig. 2. Pierre d’Hancarville, Collection of Etruscan, Greek and Roman antiquities from the cabinet of the Honourable William Hamilton, Naples, 1766. Hamilton’s second collection of vase engravings, published this time by Tischbein, also expresses a similar desire to provide useful models for artists. Tischbein writes, “I am convinced that the study of them wou’d be of more use to Artists, than they are at present aware of, for it is highly probable…that the drawings on many of these [vases] were originally taken from paintings of the very first Master’s in Grece.” Here Tischbein is referring to the contemporary belief that Greek vase paintings were taken from ancient wall paintings. Hamilton’s engravings were part of a tradition of artistic copy. The Collection situates “the ancient pot painter and his modern imitator in a genealogical tradition of copying: an aesthetic exercise that forever attempts to recoup the masterpieces of antiquity.” Clearly, copying did not dilute references to the Antique; rather, they were part of the eighteenth-century artistic rhetoric. Copies derived from the Collection, then, were conscious references to the Antique. Now that we have established the appropriateness of the copy in the eighteenth century, it makes sense that Hamilton’s catalogs did not truthfully recreate the ancient vases. The engravings ignored the vases’ fragmentary condition and instead presented them as reconstructed or improved. This aestheticization over antiquarianism, to borrow Viccy Coltman’s phrasing, enabled the transfer of the Attic pottery’s designs to paper and then into other modern media. Again, according to popular belief at the time, the Attic pottery was already a three-dimensional copy of a design that was originally two-dimensional. It is evident how Hamilton’s catalog worked to aestheticize his Greek vases in examining the engraving of the Meidias Hydria (Fig. 3). This engraving was taken from the upper register of the Meidias Hydria (Fig. 4). Since the design on the original vase wraps around the vessel’s body, the catalog necessarily flattens it to allow for ease of copying. Since the figures are no longer a part of a vessel design, each grouping stands alone as if for selection by the designer. As we will see, this is indeed how the engravings functioned. Fig. 3. Engraving of the upper scene of the Meidias hydria. Collection of Etruscan, Greek and Roman Antiquities, vol. I plate 130. Fig. 4. Att. to the Meidias Painter, Hydria, ca. 420-400 BCE. Red-figure ware Attic pottery. Hamilton Collection, British Museum. Although the emphasis here is on “pretty ornaments” in relation to women, which was indeed the only appropriate entry point to the Antique for women, it is evident here that aristocratic women possibly experienced Hamilton’s catalogs. However, the contents of the catalogs were certainly accessed by women through the designs they inspired, such as those produced by Wedgwood and Spode. It was design factories like Wedgwood’s that allowed for the dissemination of Hamilton’s vases to the general English public. Wedgwood met Hamilton in the 1770s and continued to correspond with him until Wedgwood died. Wedgwood is known to have had and used Hamilton’s volumes. We see from a 1770 catalog of books belonging to Wedgwood that “the library of the Wedgwood firm possessed as pattern books copies of the volumes acquired as ornaments for the country house libraries of Wedgwood’s classically educated aristocratic patrons.” Such patrons included the Marquis of Lansdowne and Lord Dartmouth. The Wedgwood factory was commissioned by these aristocratic clients to produce copies of the Hamiltonian vases that were tailor-made for their spaces. Wedgwood offered either a direct copy of an antique vase or a reproduction “in the style of” or “inspired by” the Hamiltonian vases (Fig. 5). These modern antique ceramics were made of black basalt pottery, which further connected them with the Grand Tour site of Vesuvius. Fig. 5. Wedgwood, Vase, ca. 1780. Black basalt, H 18 in. Metropolitan Museum of Art. …few now think of Grand Tour Italy when they see or purchase Wedgwood products, so thoroughly has this brand of ‘china’ become anglicized. Eighteenth-century consumers, on the other hand, were at least intuitively aware that these objects were conceptual hybrids such commodities were both classical, in the cosmopolitan sense, and quintessentially national, in the British sense. Thus, it could be argued that Piranesi’s prints and Wedgwood’s vases are cultural exemplars of the duality of British identity in the Georgian era— a construction that used the materials of the international neoclassicism whose capital was Rome for the purpose of national self-identification. When English ceramics were used, users were reminded of the elite Western cultural tradition from which they came, which was not unlike the reasons for taking a Grand Tour in the first place. Many of Wedgwood’s ceramics for the mass-market featured designs directly inspired by the Grand Tour, such as this creamware plate with a central design from Hamilton’s vase catalog (Fig. 6). Other English ceramic manufactories, such as Spode and Herculaneum, developed Grand Tour designs as well. 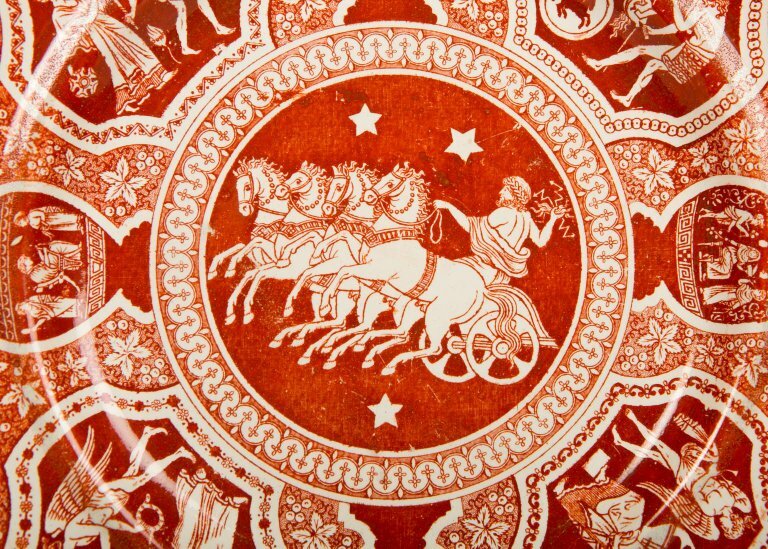 Spode’s Greek pattern wares, a design which debuted in 1806, were popular and featured designs from the Hamilton vase collection, as well as Attic vases themselves (Fig. 7). Additionally, the Spode Greekware evokes Hamilton’s Collections with its various “views” of vases in vignettes around the dishes’ borders. Collections features different views of the Hamiltonian vases (side, cross-section, etc.) to make them easier for designers to copy. Women could also have their own “copies” of antiquity. Spode dishes feature the Portland Vase and the Warwick Vase, vessels which were both widely copied themselves (Fig. 8). Fig. 6. Wedgwood, Plate, ca. 1775-80. Creamware. The central figure of Aphrodite is based on the Meidias hydria in Hamilton’s AEGR. Fig. 7. Spode, Greek ware dinner plate, ca. 1810. Pearlware. Collection of Bardith, Ltd. Fig. 8. Spode, Soup Plate in Portland Vase pattern, ca. 1831. Transfer-printed earthenware. Fig. 9. Spode, Dinner Plate in Rome or Tiber Pattern. Transfer-printed earthenware. Greek and Roman antiquities were not the only Grand Tour subject on English ceramics. Also present were Italian landscape, architecture, and monument scenes. Spode in particular utilized this imagery through Merigot’s book of engravings of Views of Rome and its Vicinity, first published in 1796. Engravings from that book appear on Spode transferwares during the early 19th century (Fig. 9). These dishes act as souvenirs for those who had taken a Grand Tour and as fanciful portrayals of the “exotic” for those who had not. Since the Grand Tour was undertaken primarily by men, these ceramics allowed women to access such a trip as well as the ideals that were promoted during those travels. “China,” a generic term for ceramics that is still used even today, used to have connotations of exoticism, trade, and mercantilism, and though by the mid-eighteenth century the English began to make their own porcelain and pottery, china’s tradition of import carried on. China’s exotic connotations typically come from chinoiserie patterns such as Spode’s Blue Willow pattern. However, since women were for the most part prevented, or at least discouraged, from taking the Grand Tour, images of foreign Italy can also be read as exotic for female users. Thus fine china at the tea table, especially if it was domestically produced, added an underlying symbolism to the ritual: on a national level, it evoked the ‘glories’ of mercantile expansion, demonstrating how the foreign had be brought home, transformed, possessed. On a familial level, it testified to the status of a particular family who participated in that same mercantile expansion. The pleasing surfaces of plates and cups reflected the wealth and taste of those who possessed them. English ceramics domesticated the Grand Tour and brought the foreign to the table for women to possess. These wares demonstrated the wealthy status of their owners by connecting them to an aristocratic tradition of traveling throughout the Continent. Wedgwood believed that the dissemination of Classic designs through high-quality copies would promote “good taste.” Women could take ownership of that good taste, which, for a man, would have been cultivated on a Grand Tour (as we have seen through the Wedgwood reproductions), through the arts of the table. Though English women, for the most part, were unable to embark on a Grand Tour to Italy, the experiences which a (male) Grand Tourist would have had were partially available to women through their tableware. Hamilton’s vases engravings were integral to the dissemination of Classical designs in England. Ceramic makers such as Wedgwood and Spode translated those designs to the ceramic market, where they enjoyed a wider audience beyond the Grand Tourist. In an interesting parallel, Deborah Lyons has shown that Ancient Greek women were actually quite involved with the selection and management of ceramics for their homes. Thus ceramics such as Wedgwood’s and Spode’s, with their allusions to Classical Antiquity, placed 18th-century English women in a Western tradition of collecting and caring for ceramics. Grand Tourists sought to establish cultural connections with Antiquity, so perhaps tableware was women’s way of accessing the antique. John Brewer, “Whose Grand Tour?” In The English Prize: The Capture of the Westmorland, An Episode of the Grand Tour, ed. María Dolores Sánchez-Jáuregi and Scott Wilcox (New Haven and London: Yale University Press, 2012. Viccy Coltman, Fabricating the Antique: Neoclassicism in Britain, 1760-1800 (Chicago: University of Chicago Press, 2006), 55. Pierre d’Hancarville, Collection of Etruscan, Greek and Roman antiquities from the cabinet of the Honourable William Hamilton, Naples, 1766. Vol. I pg. xviii. Ian Jenkins and Kim Sloan, Vases and Volcanoes: Sir William Hamilton and His Collection (London: British Museum Press, 1996), 182. Viccy Coltman, Fabricating the Antique: Neoclassicism in Britain, 1760-1800 (Chicago: University of Chicago Press, 2006), 90. J. H. W. Tischbein, Collection of Engravings from Ancient Vases Discovered in the Kingdom of the Two Sicilies between 1789-90, Naples, 1793, Vol, . 38. Viccy Coltman, Fabricating the Antique: Neoclassicism in Britain, 1760-1800 (Chicago: University of Chicago Press, 2006), 73. Viccy Coltman, Fabricating the Antique: Neoclassicism in Britain, 1760-1800 (Chicago: University of Chicago Press, 2006), 86. Viccy Coltman, “Sir William Hamilton’s Vase Publications (1766-1776): A Case Study in the Reproduction and Dissemination of Antiquity,” 5. Lord Kildare to his mother, 24 February 1767, in Brian Fitzgerald, ed., Correspondence of Emily, Duchess of Leinster (Dublin: Stationery Office, 1957), 3: 529. Beth Kowaleski-Wallace, “Women, China, and Consumer Culture in Eighteenth-Century England,” Eighteenth-Century Studies 29, no. 2 (1995): 157. Christopher M.S. Johns, “Visual Culture and the Triumph of Cosmopolitanism in Eighteenth-Century Rome,” in Roma Britannica: Art Patronage and Cultural Exchange in Eighteenth-century Rome, ed. David R. Marshall, Susan Russell, and Karin Wolfe (London: The British School at Rome, 2011), 14. Beth Kowaleski-Wallace, “Women, China, and Consumer Culture in Eighteenth-Century England,” Eighteenth-Century Studies 29, no. 2 (1995): 159. See John R. Haddad, “Imagined Journeys to Distant Cathay: Constructing China with Ceramics, 1780–1920,” Winterthur Portfolio 41, no. 1 (2007): 53-80. Deborah Lyons, Dangerous Gifts: Gender and Exchange in Ancient Greece (Austin: University of Texas Press, 2012).